In order to make use of the privileges offered by the school when running a reunion, the reunion must be officially recognized by the school. 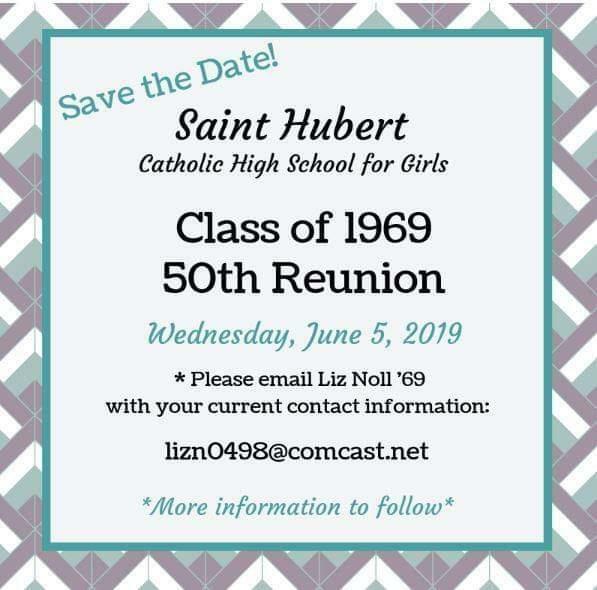 So, please contact Charlene Hughes Ritchie '70 at 215-624-6840 x253 or critchie@huberts.org. If you go through the school, we are able to provide you with class lists and addresses and can post the information on our website. A reunion that goes through the school also allows you to take advantage of the tax exemption status of the school. This is also valid for combined reunions of St. Hubert and FatherJudge. Tickets $60 each. Includes buffet dinner, open bar, DJ. Tickets will not be mailed • Check in list at door.for paid guests. NO TICKETS SOLD AT DOOR. All payments must be received by May 1, 2019. Checks only. with your current contact information.